The Hyundai Azera was officially named and brought to the American automotive market for the 2006 model year. Originally branded as the XG300 and XG350, the Azera was first offered in SE and Limited trim levels. Hyundai wanted to provide an affordable luxury vehicle to the U.S., with a lower price point than the competition. The midsize luxury sedan is currently in its fifth generation, and offers drivers more than it ever has in the past. The Azera features a new design and a longer list of standard features for the 2015 model year. Drivers will appreciate the impressive class-exclusives included on the Azera, ranging from interior space, to luxury amenities. 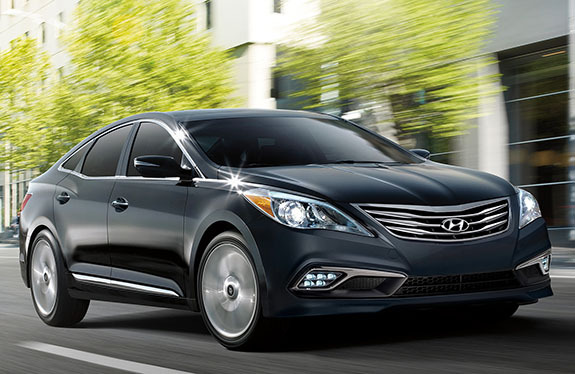 The 2015 Hyundai Azera is offered in two well-equipped trim level models, and starts at just $34,000. From the front exterior, to the rear interior of the 2015 Azera, the new design of the midsize sedan is sure to turn heads. Featuring a completely redesigned grille, front and rear bumper fascia, newly designed 18-inch alloy wheels, new LED fog lights, and standard hands-free smart trunk opener, the 2015 Azera is packing a lot within it’s new design. The luxury sedan also received Hyundai's Fluidic Sculpture design, which was inspired by the mechanics of flight. The new exterior design features a long, light, and low appearance, with a sleek roofline and wraparound LED taillights. The powerful winged chrome grille and HID headlamps complete the look of ultimate luxury. SiriusXM Travel Link with traffic, sports, weather, stocks, fuel prices, movie times, additional multi-cultural channels and recording capability. The new interior of the Azera is completed with a new center stack design, and redesigned illuminated door sill plates that also come standard. The 2015 Hyundai Azera features more than what immediately meets the eye. The hands-free smart trunk is a class-exclusive technology, that is leading the segment in cargo convenience. The innovative trunk automatically opens when the driver stands within three feet behind the vehicle, with the Proximity Key, for more than three seconds. Other vehicles have tried to create this convenient technology, but drivers are left shaking their leg, or kicking their feet to engage the system. The Hyundai Azera is completely self-reliant, and does not require any tricks to open. The 2015 Azera also features best-in-class front head and leg room, providing more space for drivers and passengers to stretch out, without fear of being cramped. The Azera boasts 40.3 inches of front head room, and 45.5 inches of front leg room. The Nissan Maxima comes in short with only 38.5 inches of front head room, and 43.8 inches of front leg room. 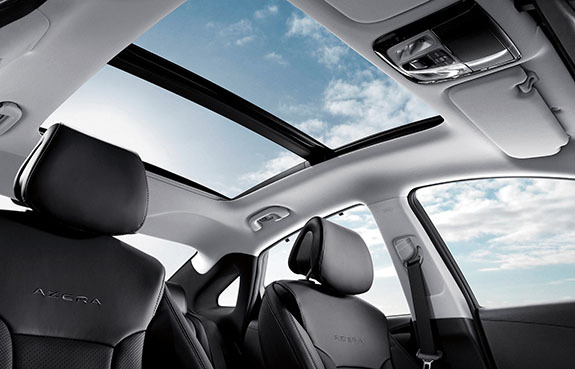 The 2015 Ford Taurus will also leave passengers feeling cramped, with only 39 inches of front head room, and 41.9 inches of front leg room. The power and performance of the Azera is also impressive, and the sedan boasts best-in-class specific output with 88.8 HP/liter. The only competitor to come close to the same specific output level is the 2015 Chevrolet Impala, which stops four full points short with a specific output of 84.7 HP/liter. With this many class-exclusive features, the 2015 Hyundai Azera is leading its segment, and setting a new standard for high quality, midsize sedans. Both 2015 Azera models come well-equipped, with more standard features than previous model years. The Azera starts at $34,000, but for just $4,300 more, drivers can opt for the all-inclusive Azera Limited, and truly sit in the lap of luxury. The 2015 Azera Limited offers drivers the following equipment and features, all for under $40,000. Power & Performance: Under the hood of the Limited is a 3.3-liter V6 engine that gets 293 horsepower, and 255 lb.-ft. of torque. The standard 19-inch alloy wheels will keep the Azera moving along with standard front wheel drive and a six-speed automatic transmission with SHIFTRONIC and Active Eco Assist. The Azera Limited gets an impressive 28 miles per gallon on the highway, and 19 mpg in the city. Exterior Refinement: The Limited shares the same incredible standard features as the base Azera has, as well as High Intensity Discharge Xenon headlights, and LED front fog lights. The 2015 Hyundai Azera clearly stands out from all other vehicles in its segment, offering drivers more standard options, and class-exclusive amenities, all at a great price.